Meet the experienced, knowledgeable medical team at Sollay Medical Center. The Sollay Medical Team has more than 70 years of experience providing family practice care in both community and hospital settings. Dr. Baker received his Bachelor of Science and Masters of Science degrees from the Johns Hopkins University in Baltimore, Maryland. He completed his doctor of medicine (MD) degree at the George Washington School of Medicine. Dr. Baker was accepted and completed his internship and residency program in family medicine, added studies in women’s health at the Medical College of Virginia in Richmond, Virginia. Dr. Baker is board certified in family medicine, emergency medicine, geriatric medicine and forensic medicine. He is a Certified Medical Director by the American Medical Directors Association (AMDA). Dr. Baker currently serves on the Board of Directors for national organizations including the American Association of Physician Specialists (AAPS). Dr. Baker currently is the President of the North American Association for Light Therapy (NAALT). Dr. Baker has served as peer reviewer and forensic medical expert throughout the United States. He is a clinical preceptor at the University of Maryland School of Nursing. He has written and lectured extensively on medical practice issues including the use of phototherapy as a curative treatment of medical conditions. Dr. Baker has been in full time clinical practice for over thirty years. Dr. Baker has written extensively and speaks around the world about the clinical applications of medical lasers. Modesta Vesonder began life in Kenya and completed her high school studies while living with her Kenyan family. Subsequently, Modesta immigrated to the United States and began her academic graduate studies. Modesta graduated from Montgomery College with an Associate of Science in Nursing. She then proceeded to the University of Maryland School of Nursing in Baltimore where she received her Bachelor of Science. Modesta continued her graduate studies and received her Masters of Science degree in Nursing in 2007. Modesta is board certified to practice medicine in the areas of adult medicine and geriatric medicine. Modesta currently practices at Good Samaritan Hospital departments of adult and geriatric medicine; Good Samaritan Nursing Center and private practice. Modesta has extensive training in the application of medical therapeutic lasers and has certifications in laser application. Modesta Vesonder has over ten years of experience in adult/geriatric medicine and the application of medical and therapeutic lasers in the treatment of medical conditions. 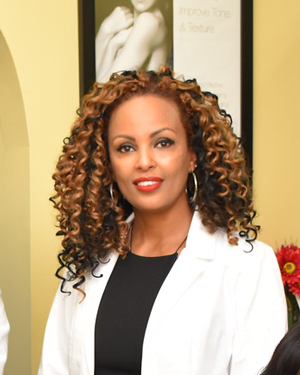 Sollay Laser Center is proud to introduce Dr. Hana Kelele as a member of our growing healthcare team. Dr. Hana Kelele has received many academic awards and honors since 1999 such as Golden Key National Honor Society and the Bata Delta Honor Society. Dr. Kelele has developed a special interest in her family medicine skills to help people to achieve their best health and overall appearance. Dr. Kelele has received advanced training on the application of laser technology, ineluctable fillers and medications such as Botox. Dr. Kelele uses the latest technology to assist her patients to achieve their best possible appearance. Dr. Kelele specializes in designing skin health programs especially for you. Call for an appointment today. Doctor of Nurse Practice (DNP), Chatham University and University of Pittsburgh, PA.
Family Nurse Practitioner – Board Certified (FNP-BC), George Washington University. Master of AScience in Nursing (MSN), George Mason University. Bachelor of Science in Nursing (BSN), Georgia State University. Michele Martusezewski is a licensed esthetician and permanent make-up artist. Michele has been helping people achieve their skin care goals for over 25 years. Michele has an extensive knowledge of products and treatments that allow her to customize an effective plan of action for your specific needs. Along with her experience in skin rejuvenation she is an accomplished permanent make-up artist. This is a specialized form of tattooing that enhances any area where it is applied and relies on an experienced hand to ensure a beautiful result. Michele has been certified in permanent cosmetic tattooing since 2001. Michele is an expert in the enhancement of eyebrows, eyelids and lips.